In November 1994 all the known island ex-service veterans, about 45, were contacted by telephone and invited to meet at a local hall to discuss the possibility of erecting a monument. This meeting, which was held about two weeks later with 30 veterans present, supported the concept of a monument. A committee of eight volunteers was organized to make investigations in respect to location, size, type, composition and funding. 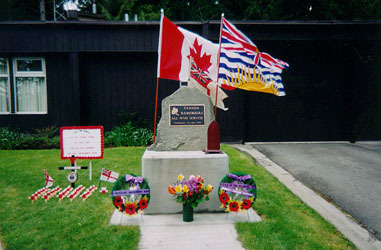 At this meeting it was also decided that this monument should be a Cairn rather than a Cenotaph, and that the project would be called the "Gabriola Memorial Cairn". In February 1995 a second meeting was called to hear committee recommendations and to discuss the project in general. At this meeting the following was determined: the location was suggested as being placed on the lawn of the Royal Canadian Mounted Police detachment's office, other locations were discussed but rejected for various reasons. Composition would be a 4` x 4` x 4` concrete base and would be mounted on an island sandstone of appropriate size. The sandstone should be flat on one side so that a bronze and cooper plaque could be mounted on it and the Cairn was not to be more than 6 - 6.5` in height. After much discussion it was decided that the plaque should bear the Veteran Affairs Canada "Canada Remembers" logo. The veterans stated that the Cairn should be for all who served and not just for those who served overseas or at home in the Armed Forces. Many citizens served Canada in other important facilities, such as, hospitals, shipyards, aircraft and munitions factories. 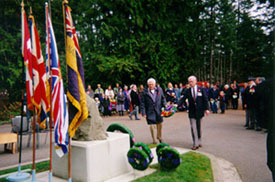 The veterans also thought it would be most appropriate for the Cairn to be unveiled and dedicated on the 50th Anniversary of VE Day, May 8, 1995. 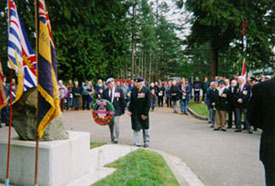 Since only a handful of island veterans were members of service organizations, such as, the Royal Canadian Legion and the Royal Canadian Naval Association and since there was no Gabriola Island veterans' organization, it was decided that the project funding would be by individual donations from veterans, and the sale of "Canada Remembers" lapel pins. The Gabriola Lions Club were also to be approached for funding. In March 1995 various tasks were allotted to committee members and after several meetings, the project began to take shape. The Royal Canadian Mounted Police were most co-operative and kindly arranged for the Cairn to be placed on their property. A suitable sandstone was found after much searching. The plaque was than ordered while local trades people volunteered to provide gratuitously both labour and material. The Veteran Affairs Canada members provided the label pins which veterans sold around the island. These proved to be a very popular item and after selling 800 there were no more available. In general, support from the community was most gratifying. Invitations to attend were sent out to Federal, Provincial and local government politicians, Royal Canadian Mounted Police Divisional HQ and to the Gabriola Elementary School, plus the local Scouts Troop. In April 1995 volunteer veterans commenced to dig the Cairn's foundation. Over the next two weeks the concrete was poured with a maple leaf etched into the surface at each corner. After a week, to allow the concrete to harden, the sandstone was craned into place and anchored to the base. On May 1, 1995, the plaque was professionally inserted into the sandstone. The whole project was then draped with a tarpaulin to keep rain off, and away from prying eyes. The program was sent for printing and the Gabriola Volunteer Fire Department offered to hose down the roadway and paths around the Cairn two days before the ceremony. On May 8, 1995, the Unveiling and Dedication Ceremony was held. The unveiling was performed by Senator Ray Perreault on behalf of the Federal Government, Ms. June Bobbie on behalf of Veterans Affairs Canada, Ted Krell representing service veterans and "All Who Served", and Joe Davis representing Gabriola's pioneers and present day residents. Reverend Donald Gordon, a former RCNVR, performed the dedication and conducted the service that followed. It was estimated that 40 veterans and 400 members of the community, population 3000+, attended. Veterans and the public were welcomed, and dignitaries were introduced by the Carin Committee's Chairperson, Peter Eastick, former RNVR. Eastick stressed the importance of "never forgetting" the sacrifices made by the men and women of our Armed Forces during the Two World Wars and the Korean conflict. During the playing of "Reveille" a fly-over was made by a World War II Harvard (trainer) aircraft flown by Phil Kalnin. The pilot flew several passes over the area, as each time he dipped his wings in salute. Following the ceremony, dignitaries and guests were entertained to a light luncheon at the nearby Agricultural Hall. "Their Names Shall Liveth for Evermore"